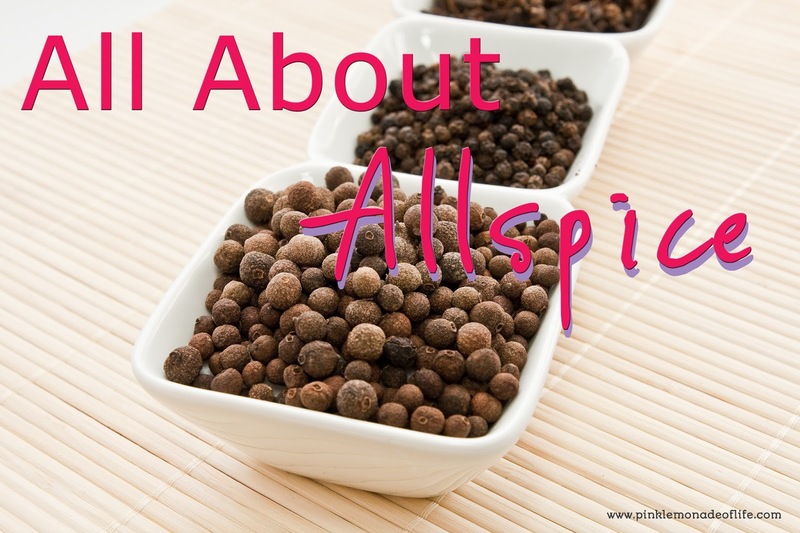 Pink Lemonade: All about Allspice! Contrary to popular belief, allspice is not actually a blend of different spices. Allspice is actually a berry that comes from the "Pimenta dioica" tree, native to Jamaica and other areas of the West Indies as well as Southern and Central America. You can find allspice in the dried berry form, or as a ground powder. We have Christopher Columbus to thank for bringing these little allspice berries with him to Europe and introducing them to the rest of the world after he thought he'd found the black peppercorns he'd been looking for. He named them "pimienta" which is Spanish for "the pepper spice." Columbus made a happy mistake that day! Allspice berries are actually a little bit larger than peppercorns, and they turn a reddish brown color when they've been dried. Jamaica grows most of the world's allspice but it's also grown in Guatemala, Honduras and Mexico. The quality, however, is the best when allspice is grown in Jamaica where the climate is perfect for the crop. You may have had that same jar of allspice kicking around in your pantry for months, but in the Caribbean, allspice is one of the most important spices in the kitchen. Native to this part of the world, allspice is one of the predominant flavors in Caribbean cuisine. If you've ever enjoyed "jerk" chicken or meat, you've enjoyed the spicy flavor of allspice. Allspice has been used as a digestive in traditional medicine for many hundreds of years. If you add allspice to foods that are a little hard to digest (the foods that give you gas!) you might find a difference. Allspice is a highly antibacterial food and is also effective in decreasing inflammation in the body. I love the peppery taste of allspice and I use it all the time in stews, soups and curries. Add some allspice to your marinades, fruit pies and meat rubs. I bet you'll love it! Whole allspice berries will keep indefinitely if you store them in an airtight container out of direct sunlight but the ground powder should only be kept for a few months, tops. If you buy allspice in its whole form, grind the berries as you need them with a mortar and pestle or a pepper mill. They tend to lose their aroma and flavor shortly after they've been harvested. Combine all ingredients in the slow cooker. Cover and cook on LOW for 8 hours. Stir well, remove bay leaves, serving when beef falls apart and vegetables are tender.